152 mm/47 D.P. Mk174 х 3 pcs. 20 mm Oerlikon Mk418 х 1 pcs. 40 mm Bofors Mk112 х 2 pcs. 20 mm Oerlikon Mk424 х 1 pcs. Seattle — American Tier IX cruiser. One of the first versions of a U.S. Navy light cruiser with a dual-purpose 152 mm artillery as the main battery. Further development of the project led to the creation of Worcester-class cruisers. Some aspects of Tier IX's Seattle will feel like a downgrade for players who took the time to play through Cleveland at Tier VIII. Seattle is notably longer and bulkier, trading Cleveland’s compact hull and svelte handling for a hull form and layout that has much more in common with her heavy cruiser counterpart Buffalo. Indeed, if placed side-by-side with Buffalo, captains will notice many similarities (such as her amidships aircraft catapults) and a couple of glaring changes. One of the most notable differences between Cleveland and Seattle is the loss of the former's 5"/38 dual-purpose secondary turrets. These venerable guns — found in a myriad of places across American ships of all classes — that comprised the long-range anti-aircraft battery at Tier VIII have been replaced by Seattle’s 152mm/47 Mark 17 dual-purpose main battery at Tier IX. It's an awkward trade, but it ends up working out slightly in Seattle’s favor, as her outer AA bubble picks up an extra kilometer of range while the DPS is basically a wash. Seattle’s mid-range AA bubble is notably more powerful, though, as she packs a dozen quad 40mm Bofors mounts; her AA DPS at mid-range is 50% higher than that of Cleveland. Seattle’s main battery guns themselves are also something of a mixed bag. The ship can equip Main Battery Modification 3 ( ) and lower her reload time to 5.7 seconds, but the traverse speed of her turrets is already slower than that of Cleveland and the aforementioned upgrade makes it even worse. Captains who invest in the Expert Marksman skill can recoup most of this lost traverse speed, but will still find themselves frustrated with how slow her turrets move for a light cruiser. The shell performance of Seattle’s guns remains identical to the American light cruisers before and after her, and she retains the lightly armored citadel of her light cruiser brethren. Seattle’s armor belt — such as it is — is longer than that of Cleveland and extends across more of her waterline, but tops out at 102mm (25mm thinner than that of her predecessor). She is decidedly less well-protected. From a handling perspective, Seattle both an improvement and a downgrade from Cleveland. She's faster by about a half-knot, but responds to her rudder slower and has a notably larger turning circle. Captains who have grown accustomed to navigating the tight confines of certain maps with Cleveland are advised to spend some time learning how Seattle handles prior to attempting the same kinds of maneuvers. Like all other Tier IX cruisers, she gains access to the Repair Party ( ) consumable, which greatly increases her longevity in the hands of a heads-up captain. Appraised of all these nuanced differences, captains are advised to treat Seattle as a slightly larger, slower handling, and harder-to-conceal Cleveland. Most of the tactics and strategy used to work through Cleveland will still apply to Seattle; maximize use of them and move on towards Worcester. Same decent range as Cleveland. Decently fast turret traverse, though slower than Cleveland’s. Good maneuverability: decent acceleration, speed, turning radius, and good rudder shift time. Very lightly armored; same armor for her belt, superstructure, and turrets as Cleveland, but her citadel and turret barbettes are much less armored in comparison. Larger citadel than her predecessor; can easily be taken out by other fast firing cruisers such as Neptune in close ranges. Just enough citadel armor that armor-piercing bombs will cause citadels (and AP bomb dispersion while Defensive AA Fire ( ) is active is still tight enough to cause heavy damage). Hull: Upgrade to Hull (B) for more health, better anti-air, and faster rudder shift. Research of this module unlocks progression to Worcester. Slot 2: Steering Gears Modification 1 ( ) reduces the chances of having to repair the rudder. Slot 3: AA Guns Modification 1 ( ) to bolster the outer AA envelope. Slot 4: Propulsion Modification 2 ( ) for better acceleration as the ship already has good enough rudder shift time. Slot 5: Concealment System Modification 1 ( ) to lower detection radius. Slot 6: Main Battery Modification 3 ( ) for faster main battery reload time. Key skills for Seattle commanders include Jack of All Trades, Superintendent, and Concealment Expert. 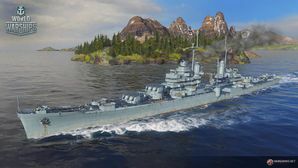 Players who wish to spend doubloons can equip Seattle with Type 19 camouflage that lowers her detection radius, reduces the accuracy of incoming shells, reduces her repair costs, and increases the amount of experience she earns. This page was last modified on 19 February 2019, at 08:42. This page has been accessed 36,779 times.